The M8 is an updated version of the M7 with DSP technooogy for upgraded performance, but they are very similar overall. The Meloson M7 was the first product from this new company and it is unusual in several ways. It is powered by a rechargeable Lithium Ion battery and recharges via its USB port from a computer or any USB charger…no AC adapter is provided. However, unlike most radios with built-in changers the M7 features an intelligent charging system which charges until the battery is full then switches off so there is no guesswork involved…a charging indicator light is orange when charging and green when charging is complete. 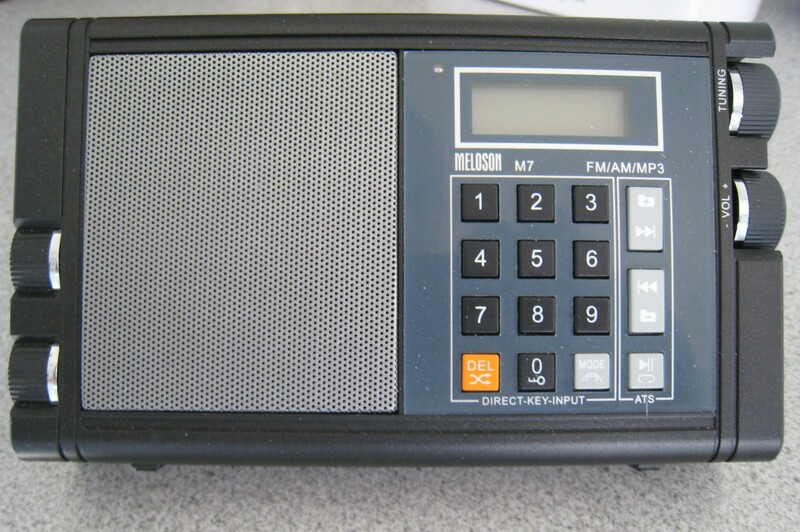 Cell phones and the like have been doing this for years…it’s nice to finally see a radio that does it too. The M7 comes with a detachable (and easily misplaced) kickstand to sit the radio at a convenient angle, a wrist strap, a short mini-jack audio cable and a USB cable. General Observations: Battery life is excellent…the manual claims over 10 hours at medium volume…over the course of a weekend I used mine in MP3 mode at least that long at sometimes loud volumes and it was still going strong. Chip Storage: There is room to store 2 additional micro-SD chips in the battery compartment. There is a Light Sensor which turns on the LCD illumination when ambient light is low..a very nice touch. Five EQ’s can be selected but only when playing MP3 files. They are all too heavy-handed…I found the Default (#1) and #3 positions to be the most useful. Fake Knobs: Two fake knobs on the left were clearly put there to resemble the Grundig Satellit 500 and 700 radios (*see picture below)…odd to say the least! AM/FM operation is straight forward with a minimum of controls. An On/Off slide switch, standard rotary volume and tuning thumbwheels and a standard format keypad for direct frequency input. The keypad and real volume and tuning knobs are a rarity at this price and welcome indeed. MP3 Playback is simple as well, either from a Micro SD Card (which the manual refers to as a TF [Trans-Flash] card), or standard 1/8″ mini-plug input jack. Navigation via the LCD display does have a major limitation in that it can only display folder or track numbers…after loading hundreds of songs intp several folders onto a Micro SD Card it was almost impossible to find any particular tracks…I found it best just to let it play. Performance on AM and FM is adequate for typical local and suburban signals…the M7 is no DXer but for routine reception of typical signals it does OK. There is some digital interference on weaker AM signals as you would expect but it does a credible job with signals of any reasonable strength on both bands. Sound quality is satisfying and a bit better than you might expect for the M7’s diminutive size…you can actually listen to it and enjoy what you are hearing. MP3 sound is amazing for its size and generally very satisfying. There is a 5 position sound button that tailors the sound to the source quality and your preferences. Although it seems like nit-picking at this price point, I do wish they had designed their 5 built-in EQ’s a bit better because the potential is there…the M7/M8 sounds amazing for its size . One unusual thing is the dummy knobs on the left side. 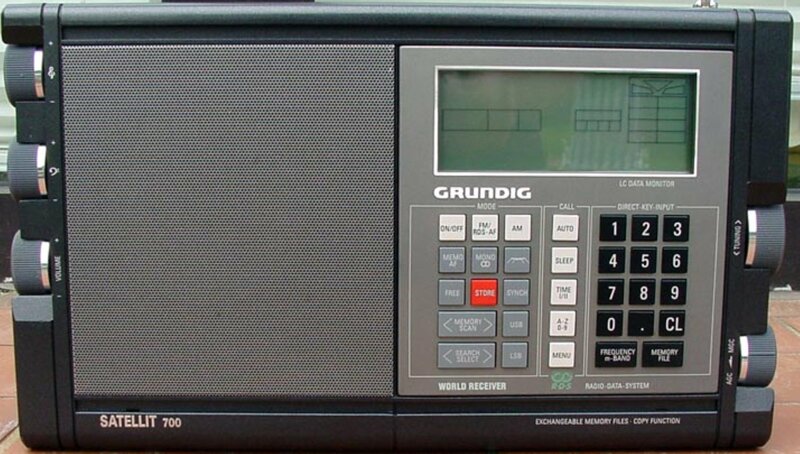 Clearly this is a cosmetic copy of the vintage Grundig Satellit 700 (*see picture) but those two knobs are nothing more than molded plastic…part of the case and don’t move or have any function…strange. Conclusion: The Meloson M7/M8 is a very cute, small device with adequate AM/FM reception, direct keypad frequency entry, real volume and tuning knobs, built-in smart charging system and flexible MP3 playback from a variety of digital and analog sources. Those two dummy knobs notwithstanding it offers credible performance, pleasant sound and a host of features that belie its low price. While it doesn’t attempt to compete in the realm of high performance radios it offers a great set of feature for MP3 lovers and in that light is a cool new toy.